The collapse of a pedestrian bridge at Florida International University (FIU) in Miami yesterday that left six dead is raising questions over how the supposedly state-of-the-art project could fail. 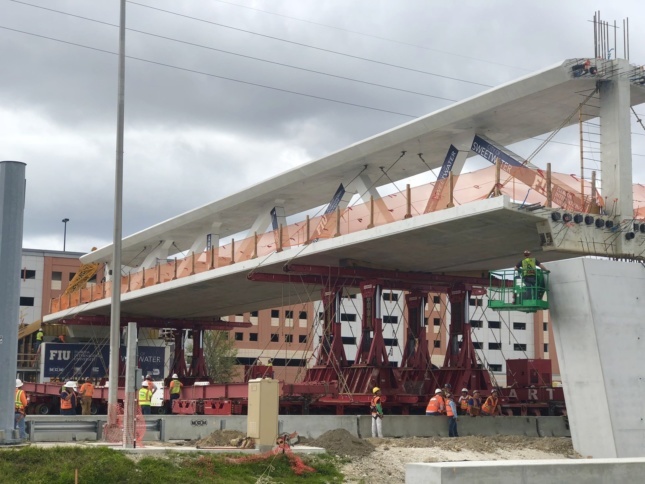 The 174-foot-long, 950-ton span was assembled on the side of the road and later rotated into place by Munilla Construction Management over the course of only 6 hours, after testing by structural firm BDI. 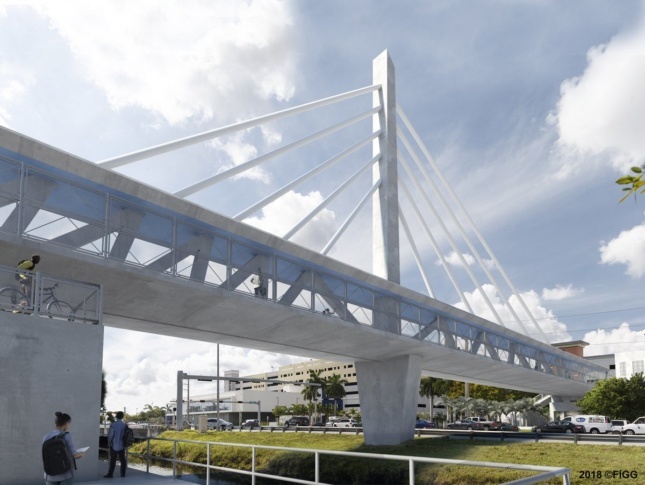 The FIU bridge, meant to cross eight lanes of traffic at a particularly dangerous intersection in front of the school, was designed to double as an amenity deck and would have featured a bike lane for students. Instead of being constructed in situ, the span that collapsed was built on temporary supports on the side of the road, and rotated 90 degrees into position on March 10th. Using this “Accelerated Bridge Construction (ABC) method” to build the bridge’s superstructure elsewhere was touted as a way to cut costs and minimize disruptions to traffic below. According to a press release from LIU, the bridge would have also been the first in the world to have been constructed from self-cleaning concrete. It’s currently unclear whether the construction methods used to build the span played a part in the collapse, which flattened the cars underneath at the time. 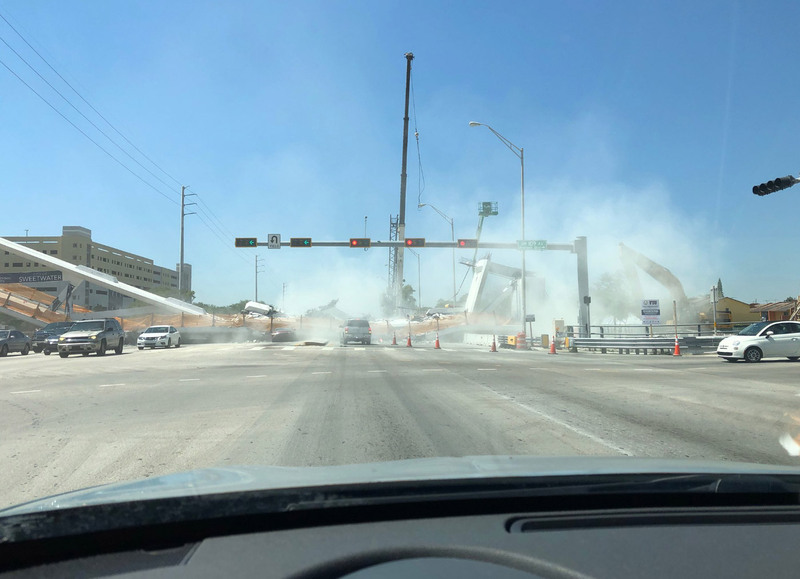 Miami-Dade Mayor Carlos Gimenez had said earlier that day that the bridge had just successfully completed stress testing. In a statement given to the Miami Herald, FIU President Mark Rosenberg said that the testing was done in accordance with best practices. Florida Senator Marco Rubio took to Twitter to discuss the work being done on the bridge before its collapse, saying “The cables that suspend the Miami bridge had loosened & the engineering firm ordered that they be tightened. They were being tightened when it collapsed today”. The engineering firm Rubio is referring to is FIGG Bridge Design, who were collaborating with Munilla to build the bridge. While the span was to be supported by steel suspension cables installed from a central column later on, Rubio may have been referring to tension cables inside of the bridge itself. It’s unclear what form of temporary support was holding up the bridge at the time of the accident. At the time of writing, it’s unclear why engineers had chosen to stress test the bridge while allowing traffic to pass underneath, or if the cable tightening had played a role in the failure. The $14.2 million bridge, financed through a US Department of Transportation TIGER grant, had originally been slated to open in early 2019.